Timelines Time Tracking app: insight & download. Time is the most precious resource that we have in our lives. The way you decide to spend your time has a paramount effect on your life. I personally wasn't happy with the way I was spending my time, so I decided to build a tool to help myself and others figure out a way to become more efficient. Timelines has been enabling me and other users understand where our time is actually going, helping us improve our routines and achieve more in our lives. I sincerely believe it can do the same for you. Timelines has been featured by Apple in New Apps We Love section, and highlighted on Product Hunt, 9To5Mac, MacStories, WatchAware, and AppAdvice. 2. See where it goes. Discover how some of it gets wasted. 3. Improve your routine. Reduce time-wasting activities, increase efficiency. • Interactive timeline – See the big picture of weeks and months or the nitty gritty details of specific days. 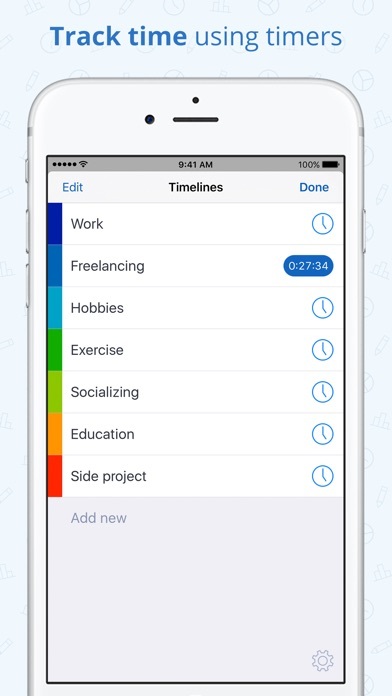 • Track any activity – You can create a 'timeline' for anything you want. Just type a name, pick a color and you're ready to start tracking it. • Quick time tracking – You can start and stop timers with just 1 tap. • Today widget – Save yourself time by starting timers directly from the lock screen. Just swipe left and tap to start a specific timer. • Statistics – See where your time goes on a pie chart. Quickly change interval by scrolling on the timeline. • Reminders – Help yourself get into the habit of using timers. Get notified to start/stop timers after a certain time of activity/inactivity. You can also act on reminders directly in the notification, or mute them for the rest of the day. • Exporting to files – Export to highly visual PDF which is ready to be printed, or CSV which is perfect for further processing. • Simultaneous timers – If you go all in on time tracking, there can be situations when you need to track two things at once. For example: listening to podcasts while cooking dinner. • Untracked time in Statistics – If you decide to track most of what you're doing, with this option you can see how much time is unaccounted for. • Color-based approach – You can assign a specific color to each activity, which makes visualizations easy to grasp. • Set start of the week – Sunday, Monday or any other day. • Archive old timelines – Keep your list of activities current and relevant by archiving old timelines. • Change Time format – Choose from hours and minutes, hours decimal; or days, hours and minutes. • App badge - Timelines icon on your home screen can show a red badge when a time tracking is active. • Filter projects visible on the timeline to drill down on specific ones or see them all at once. With Timelines for Apple Watch, you can quickly start and stop timers directly on your wrist. • Complication – Launch the watch app quickly and see timer progress directly on your watch face. • Haptic feedback – Helps you build up the habit of using timers on the watch. • Set event names using dictation, or choose from recent ones. • Change start time and end time of timers with the digital crown. Start taking control of your time today. It only takes a few days of tracking to start uncovering ways to maximize your time and productivity.